Seminars are awesome. It is always exciting to connect with some of the best minds in the field, meet new people, learn new ideas, and get rejuvenated about a topic you are passionate about. But let’s be honest. Often they are prohibitively expense, sometimes they are filled with BS info from crappy presenters, and the time and expense to travel to and from the seminar can be a real kick in the crotch. Boris Sheiko – is the head coach of the Russian powerlifting team from 1999 to 2005. His team was undefeated in international competition. His athletes won 7 European and world championships, and every athlete achieved nothing less than a bronze medal. During his career he developed 9 IPF world champions and collected 40 gold medals. Boris Sheiko is the only person in Russia who is a Professor of Powerlifting: he published over 150 articles and 15 books on powerlifting. Mike Tuchscherer – Founder of Reactive Training Systems, Mike has set world records and won gold, silver & bronze medals in IPF World Championships. Erle Engmark – Erle is from the Norwegian school of powerlifting. World Champion in the deadlift, silver medalist overall at the IPF World Championships. Bryce Lewis – Founder of The Strength Athlete, Bryce holds records in 2 different federations, and has a knack to make complex concepts simple. Mike Israetel – Mike is a professor of Exercise Science at Temple University in Philadelphia, PA. He holds a PhD in Sport Physiology. Greg Nuckols – Founder of Strengtheory, his passion is synthesizing scientific research and in-the-trenches experience to stay at the forefront of the strength game, and to become the best coach possible. Jordan Syatt – Founder of Syatt Fitness. 5x World Record Powerlifter. Featured in CNN, The Huffington Post, Schwarzenegger.com and holds a Bachelor’s of Science in Health & Behavior Science. Chad Wesley Smith – Founder of Juggernaut Training Systems. Current PRs of 440kg squat with wraps, 380kg squat in sleeves, 257.5kg bench press and 370kg deadlift, as well as 2 Top 10 totals of all-time. Matt Wenning – Matt is an absolute expert on the conjugate system, holder of 3 world records and a 2665 lbs total. He also holds a Master’s Degree in Biomechanics and a Bachelor’s in Exercise Science. Matt Gary – Powerlifting & strength coach, SSPT co-founder, USA Powerlifting Coaching Chairman. Matt has been competing for 20+ years and has coached at the highest levels in the USAPL and IPF. Martijn Koevoets – Founder of Powerlifting University, Powerlifter, Author, Blogger, Online Coach & Extreme Metal Aficionado. Loves a good whiskey. Owen Hubbard – 2015 European & World Junior Champion. Senior world record holder in the bench press. 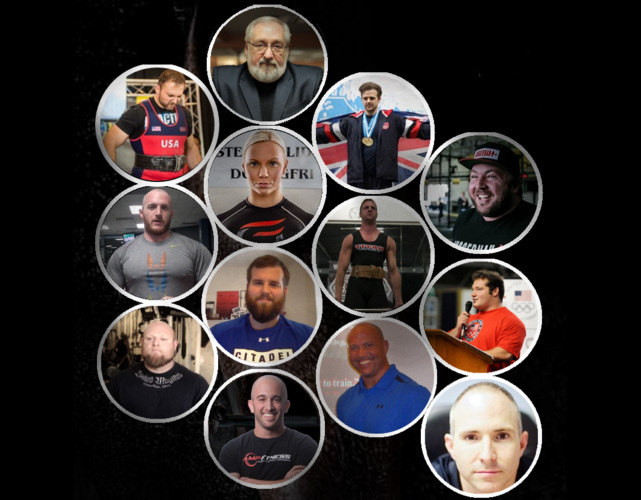 Throw myself in the mix and you have a nice baker’s dozen of powerlifting experts that are going to present to you, again for FREE, during the Online Powerlifting Summit. I am very excited to announce that I will be releasing new training charts for each of the 3 competitive lifts that will revolutionize the way you set up your programming. I have been working on these for several years and can’t wait to get them out into the lifters’ hands. It is as easy as that. Martijn tells me that these presentations will be live streamed to all devices so even if you aren’t in front of your PC you can still watch them on your phone/tablet/big screen TV/whatever. Secondarily, I believe that by signing up you get 24-hour access to the presentations. For example if you can’t make Chad Wesley Smith’s presentation on Wednesday at 12 pm EST, you still have 24 hours to log on and watch the info before it disappears forever into the digital abyss. So sign up now and get your powerlifting game on. To make it even more exciting, I will send a free, signed copy of my book All About Powerlifting* to the first person that sends me a picture of themselves – in their lifting singlet – watching my presentation (my presentation is scheduled for Thursday, March 3rd at 12 pm EST) – note I need visualize proof you are watching my presentation and not just sitting in your couch in your singlet although that is a great way to spend an afternoon. So what are you waiting for? Sign up for this puppy and bring in 4 days of powerlifting awesomeness!